Austria and Italy finished top of the rankings in today's first round of the 2018 Longines FEI Nations Cup™ Final in Barcelona. Both teams finished on just one time penalty a piece, as it all came down to time in determining qualification for Sunday’s ultimate competition. Sweden, Belgium, Ireland and defending champions the Netherlands were just behind. In a fight for the final two places for Sunday's final round, Switzerland, France, newly-crowned FEI World Equestrian Games™ Team champions USA and Germany all scored eight penalties, but the latter two were knocked out on time taken. They will take part in Saturday's Challenge Cup along with Canada, Brazil, Great Britain, Spain and last year's winners, the UAE. It was Italy’s Luca Marziani, who posted the first clear round of the competition. Riding the 11-year-old Selle Francais, Montender, the pair completed Santiago Varela’s 13 obstacle course with ease. Finishing inside the time allowed of 79.00 seconds, Luca Marziana set the tone for his teammates, and his competitors, by getting Italy off to a strong start. With second round rider Riccardo Pisani aboad Chaclot going clear, and their final rider, Lorenzo de Luca, yet to go, Italy secured their place in Sunday’s final after their third rider, Bruno Chimirri finished on just one time fault. After the first round of jumping, Italy, Belgium and France were the only three teams to go clear. However, a superb clear from Leopold van Asten for the Netherlands left no uncertainty that the reigning champions were keen to make their mark. With team riders Marc Houtzager and Frank Schuttert both on four faults, the deciding round would fall to Harrie Smolders. As only a clear round would secure a team place, the crowd hushed as Smolders, aboard the 14-year-old stallion Emerald, proved why he’s world No.1. Smolders’ clear round secured the Dutch teams place in the top eight, on a joint score of four faults with Sweden and Belgium. Canada, with only three riders, had to make every round count. Not having the the luxury of a discount score, 22-year-old Kara Chad, riding Carona, the 11-year-old mare by Untouchable, made a determined start posting a confident clear round for the team. However, the team only secured a place in Saturday’s Challenge Cup, having finished on a team score of nine faults. Finishing in fifth place and qualifying for the final were Ireland. Anthony Condon jumped a lovely clear and was unlucky to pick up just the one time penalty. Eight faults from Shane Breen and Ipswich Van de Wolfsakker proved to be the discount score after anchor rider Darragh Kenny provided a quality clear for his team, riding the 12-year-old stallion, Ballou du Reventon. The team finishing on five penalties. Lucy Deslauriers, the youngest rider in Barcelona at 19, scored a clear round for Team USA, but eight team penalties meant they finished just outside the top eight on the leaderboard. Germany, France and Switzerland finished on the same score, with the latter two progressing based on time taken. The seven teams not to qualify will now battle it out on Saturday evening, in the FEI Challenge Cup. Watch it live on FEI TV from 8:50pm CET (2:50pm EST / 7:50pm BST). 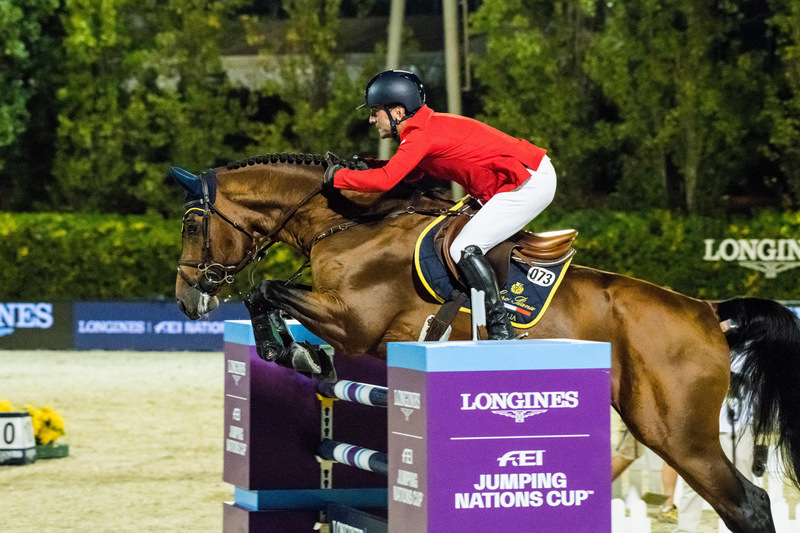 However, it’s Sunday afternoon’s final where the top eight teams of Austria, Italy, Sweden, Belgium, Netherlands, Ireland, France and Switzerland will battle it out to be crowned Longines FEI Jumping Nations Cup champions 2018. Watch it live on FEI TV.